Barry Bonds, Roger Clemens, Sammy Sosa and Mark McGwire will have less time to remain eligible for the Hall of Fame ballot under changes made Saturday. 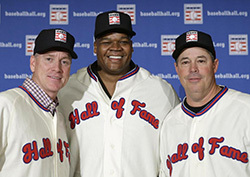 The Hall of Fame's board cut a player's eligibility from 15 years to 10, which gives McGwire a maximum of two more appearances on the writers' ballot. Bonds, Clemens and Sosa, shunned so far along with other Steroids Era stars, can be considered up to eight more times each by the Baseball Writers' Association of America.